Stormwater liners that offer long lasting and durability. Water is, has always been and will always be one of the most important commodities for any life-form to survive. As the world population grows, pollution has risen, resulting in the scarcity of clean, unpolluted water. The fear of clean water depletion has brought about green inventions and innovations. With the advancement of technology, some state of the art stormwater management systems such as the Environmental Passive Integrated Chamber (EPIC) has been engineered. This invention captures stormwater and recycles it into clean water that can be utilized for irrigation, emergency fire extinguishment and other daily water supply. Beneath the aesthetics of infrastructures such as football fields, baseball fields, community parks, lawns or even industrial buildings often lies an environmentally friendly, space saving stormwater management system. 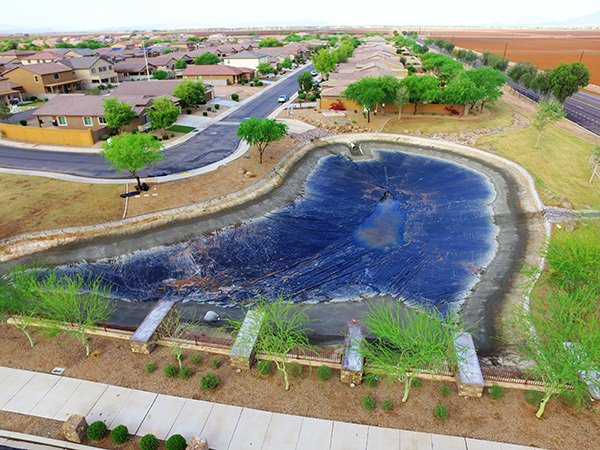 Among the layers of the stormwater management system is an impermeable geomembrane liner, ensuring the water captured and recycled does not get wasted by just seeping into the ground. A layer of non-woven geotextile, aiding in the water treatment process and filtering the water with any debris is often being utilized as well. Western Environmental Liner can help you with your geomembrane liner needs for your stormwater management system project. We have multiple factories, located in Romulus NY, Tolleson AZ and Greatbend KS that can fabricate your stormwater liner and geotextile into whatever size and shape you need. We can provide you a cost-effective reinforced polyethylene liner that can be fabricated into big panels for easier installation. In this application, with the geomembrane material often buried, our Aqua series of reinforced polyethylene is guaranteed to last well over 20 years. We can likewise fabricate your geotextile to whatever panel size you need in order to help you save time and money in the installation process. Please do not hesitate to call us today for any questions and one of our liner experts will be happy to assist you.